Welcome to our family webpage. We feel so blessed to have such beautiful, healthy,and energetic boys. God has blessed in so many ways!! Footboarding in Lake Michigan...............so much fun!! Trent's 2009 race season begins! Trent's race season begins with a rough start with a broken bike for quite a few weeks. But Steve got it going again and we are all set to ride! There will be a lot more pics of both the boys and their races soon! Jax has to have his dirtbike too! Mommy and Jax watching the races! jax loves to go camping! 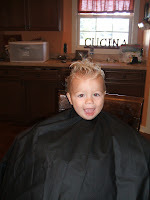 Jax Nathan got his first big boy haircut. Bye-bye curls. He had a great time and sat still for me. Look how cute and happy he is, but he looks so grown up!! Our family is definetely complete with three fabulous boys with lots of energy,fighting and danger running through their blood. We are one busy family with me running my salon and the kids getting ready for their second race season just ahead of them and Steve pushing the practices. 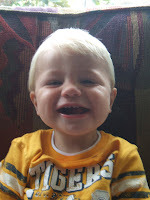 Jax is just a joyful "surpise" he is a happy baby and very easy going. We love to spend time with the rest of our family especially with Ruby and Tommy.